Steve McCadams "Casting for a Cure"
Calling all youngsters who want to catch fish and win prizes at the same time! The 14th Annual Steve McCadams �Casting For A Cure� Kids Fishing Rodeo returns to Carroll Lake on Saturday, June 8th for a fun filled morning where even little fish bring on big smiles. Girls and boys ages 15 and under are invited to participate in the FREE event which will benefit the American Cancer Society. Each year McCadams teams up with the Tennessee Wildlife Resources Agency and the big event is fast approaching. 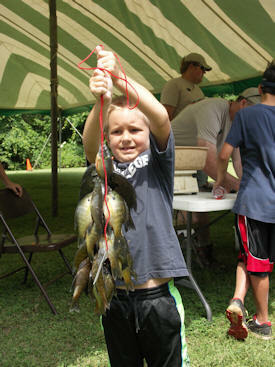 More than 3,900 kids from five states have been introduced to the great sport of fishing since the rodeo�s conception. Special plaques and bicycles will be awarded to kids catching the most and biggest fish in four separate age brackets. Age brackets will be 5 and under, 6-9, 11-12, and 13-15 years of age. �With the help of donors who open their hearts and pocketbooks each year we send each youngster home with a prize and fond memory. I know we�ve made a positive impression on these kids over the years and in so doing we helped fight cancer at the same time,� continued McCadams, who grew up fishing Carroll Lake and participated in rodeos there in days gone by. Participants are asked to arrive early and check-in at the registration tent where each contestant will receive a bag of goodies. Onsite registration will be from 7-9 a.m. with the actual competition taking place from 9-11 a.m. except for the young age bracket of 5 and under who will just fish for one hour and weigh in at 10 AM. Loaner rods will be available courtesy of TWRA so every kid will have a chance to fish. However, kids are encouraged to bring their own bait and tackle. Bait and some terminal tackle will be available for sale onsite. Concessions will be available courtesy of McKenzie Relay For Life teams. The event will coincide with National Fishing Week across America. And, June 8th is Free Fishing Day in Tennessee. Carroll Lake is located one mile east of McKenzie, TN and five miles west of Huntingdon, on U.S. Highway 22. For additional information log on to www.stevemccadams.com or call 731-642-0360. To support the event or perhaps honor someone special send your tax deductible donation to: Steve McCadams �Casting For A Cure� Kids Fishing Rodeo, 655 Anderson Drive, Paris, TN 38242. We thank you for supporting the American Cancer Society and Steve McCadams for the 8th annual �Casting For A Cure� Kids Fishing Rodeo. I look forward to seeing and meeting you at Carroll Lake on June 7th!